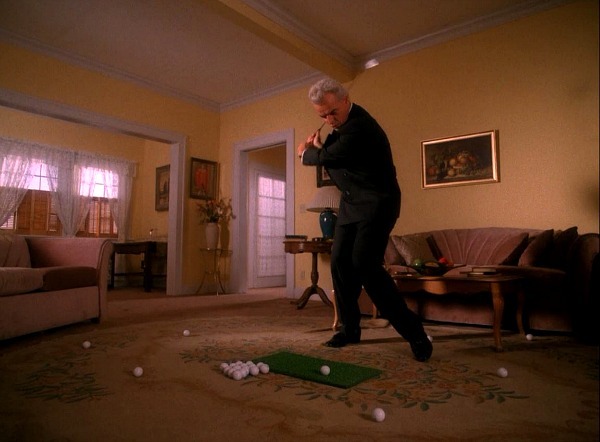 The house was used for its interiors in the David Lynch-directed pilot and for both interior and exterior scenes in Twin Peaks: Fire Walk with Me. 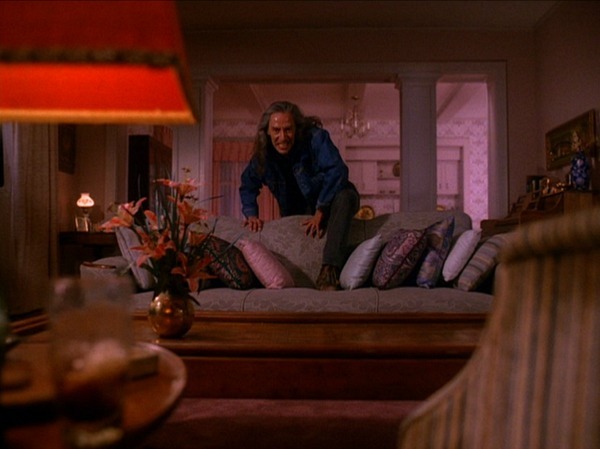 The living room, the dining room, the kitchen, Laura Palmer’s bedroom — all there and fairly recognizable. The real house doesn’t look creepy or quirky at all, and appears to be entirely demon free (always a plus). The house has 4 beds, 2 baths, and 4,100 square feet. They wanted a place where a prosperous lawyer lived but yet a place they could make a little weird because the wife was such a neurotic woman. She wanted to know if there was a room suitable for a teenage girl. And I said, ‘Well, I’ve just had three teenagers graduate from this room up here.’ The next morning I had a whole production crew here. This would be such a fun house to decorate. So much potential, especially since they’ve done a lot of the hard work already, like removing the dated wallpaper we saw on the show and restoring the hardwood floors. It’s on the market for $549,950. For more photos and information, check the listing, an interview with the homeowner, and more comparison pics at Welcome to Twin Peaks. 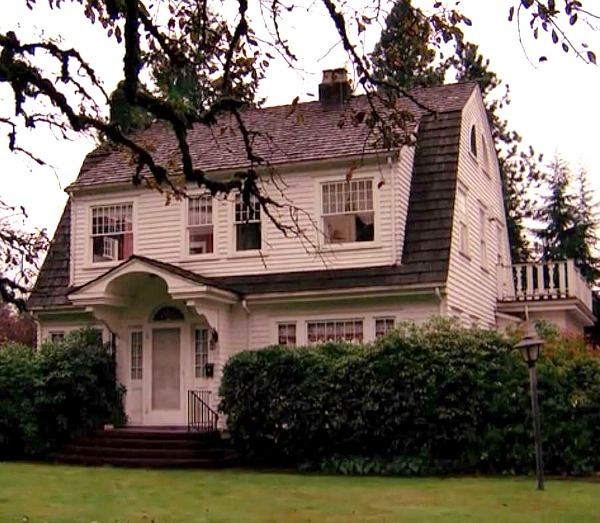 Tori & Dean's Lake House on "Cabin Fever"
Wow, great house! 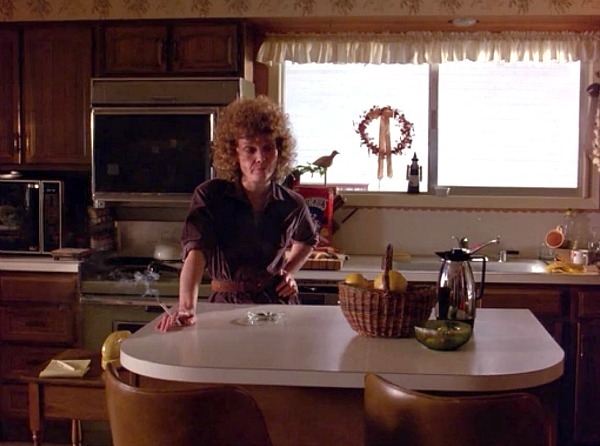 I never watched the show but the then-and-now shots are great. Amazing what hardwoods can do to a dining room, eh? And yes with a new kitchen this house would be perfect. Love the views! Wait. What? They PAY YOU for putting your house on TV? It’s big $$$. My neighbor’s house (exterior) was used for a car commercial a few weeks ago for one day. She got $3,000. (Usually ranges $2,000-$8,000 per day – more if interior is used), But it’s kinda a hassle. All the surrounding streets are blocked; all neighbors have to agree ( I even had to fill out paper work!). But, we ALL agreed to it in the hopes our house is used one day!! There is filming every day around here! Anyway, what a fun memory jog! I was in college when Twin Peaks aired and you “weren’t cool” if you didn’t watch it! That show was ground breaking; definitely influenced future shows. I always thought they chose such a classic house to offset the crazy! This house is so great in that it’s still almost original! It would be fun to take that kitchen back to the 30’s! How fun that they used your neighbor’s house, Claudia! Sounds like the day rate has gone up since this house was used in 1990. Of course for this homeowner the hassle continued because she got fans from the show coming to visit for years after. I’m sure she never imagined that the show would become such a cult classic. In CA, you don’t pay state taxes on the money you receive from the studios. (Don’t know about other states) Most people live elsewhere during filming especially if it’s longer than a day; you sign a contract if you want your house returned to original; ( most people keep the changes cuz they usually are fab improvements). Plus, you receive soooo much money ( more than enough to cover your mortgage and rent for another house plus bonus money!) If your looking at $60,000- $100,000 profit for a couple weeks who cares? BTW, real estate listings around here disclose a houses’ celebrity status ( the house is a celebrity- not the homeowners) as a perk cuz the studios use the same houses over and over again and it’s guaranteed income. Of course, we all hope for commercial use – so the house can remain incognito minus the kooky -loos! That’s how I prefer my houses. Ha. Is the house staged now? The furnishings look a bit odd and bland, can’t put my finger on what is missing….. Probably has been staged a bit since the homeowner has already moved out. I believe the interview I linked to mentions she’s in a retirement home now. Is it crazy that I went to the listing so that I could google the address and check out the neighborhood via street view?? I’m a creep like that 😉 The neighorhood is just lovely. I notice that most of the houses are craftsman style and look very west coast while the “Palmer” house is the exception with its east coast look. As a HUGE fan of this show I’m so excited to see you post about it – weird to see it all bright and open, the show/movie had a love for sheers on every.single.window. I was so fond of that Tv drama! But I could never sleep in “Laura Palmer’s bedroom”.. I would be so scared… Even if I have to admit that it’s such a beautiful house! Yeah, it might be better for someone who hasn’t seen the show and the demon crawling through her window. Ha. I’ve never watched this show, but it sounds good. This house is beautiful. I love Colonials that were built in the 1920s or 1930s. They have a similar style to Craftsmans. Thank you for sharing this with us Julia. I’m glad you were able to get your site up and running again. I love visiting your site everyday. You’re Welcome! I didn’t realize how bad your web crash was. I hope it doesn’t happen again or if it does, let’s hope not for very long. Yeah, I was kind of cracking up at some of the bizarre stuff I had forgotten about on that show. Parts of it seemed more comical than I remembered, too. Now that is a great blast from the past. My brother and I never missed the show. I don’t think I could ever sleep in that house. Hi Julia this is a lovely home I’m so glad to hear it’s demon free. My daughter and I were talking about this show just the other night and how remembering the music still freaks her out and that wrapped in plastic line would freak me out. It started well but then it went bizarre…. Thank you for sharing must tell Yve. Regards Esther (dealing with a bad back) from a very cold Sydney. PS hope you are enjoying your summer. Good point about the beam! Seems strange that they’d remove it. I wonder if that was a set built to replicate the original room and they added beams to it or something? Not sure.